﻿ The Classic Porsche Blog! According to the data and stats that were collected, 'The Classic Porsche Blog' channel has an excellent rank. Despite such a rank, the feed was last updated more than a year ago. 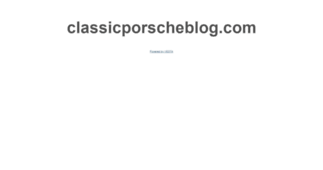 In addition 'The Classic Porsche Blog' includes a significant share of images in comparison to the text content. The channel mostly uses medium-length articles along with sentence constructions of the basic readability level, which is a result indicating a well-crafted news inventory on the channel. Medium-length materials prevail on 'The Classic Porsche Blog' that may be an effective tactic to grip their readers’ attention with a wider range of helpful content. There are also a few longer items, which can provide a deeper insight into their subjects. Moreover, there are a few short articles. 'The Classic Porsche Blog' mostly contains texts of a basic readability level which may show their aim to reach a wider audience. Besides, there are articles of intermediate readability, which make up more than one third of all content on the channel. Unfortunately The Classic Porsche Blog has no news yet. lifes too short for boring wines!